Now that Bernard Madoff is in jail, a convicted felon who almost certainly will never again walk free, it's time for an honest if painful discussion about the role that greed played in the way this scandal unfolded. Madoff's victims do not fit neatly into one group. Many were wholly innocent - they hadn't even heard of Madoff before his phony empire crumbled. They merely invested money with "managers" (whom they trusted) who then invested the money with Madoff (whom those managers evidently trusted). For these victims, the scam amounted to an unvarnished tragedy - they were betrayed by Madoff, their own traders, the market, and the regulatory system. No wonder they are steaming mad right now. I don't blame them. But this column isn't about those poor people, who saw their life savings wiped out at the worst possible time. This column is about the other class of "victim" here; the money managers and other sophisticated investors who were happy, delighted even, to reap extraordinary (unreal, you might say) returns upon their investments with their friend, their colleague, their associate, their mentor, Bernard Madoff. Year after year, they beat a roaring bull market, and even got a form of "money-back guarantee" if they did not. These Masters of the Universe thought they had the secret keys to the kingdom of financial omniscience. They routinely beat you and me and the Street and thought they had the edge of all edges. It seemed too good to be true - and, guess what, it was! But, like Marlon Brando's Sky Masterson told Frank Sinatra's Nathan Detroit in the movie Guys and Dolls, when a man comes up to you and tells you that the Jack of Spades is going to jump out of a deck of cards and spit cider in your ear don't take the bet that he won't because as sure as you are standing there you will soon be cleaning cider out of your ear. What did many of these savvy Madoff investors really think was going on for all those years when they were cashing all those fat checks? And why aren't more of them now looking into the mirror as well to discover how this calamity could have befallen them? If I'm in that first class of truly innocent investors here, I am looking to sue not just Madoff and Company but also maybe the "money managers" who knew or should have known better. There is plenty of contributory negligence to go around. Plenty of recklessness, too. Indeed, even as Madoff himself took responsibility for his massive crimes, even as he did us all a favor by avoiding a lengthy and expensive trial, some of his most intense and loyal investors were conveniently forgetting their own greedy roles in the affair. These people are, in the main, highly intelligent, highly-sophisticated, over-achieving people who had made the sort of money (or who controlled the sort of money) that few of us will ever see. They were smart enough, in other words, to have been far more cynical and suspicious about Madoff's extraordinary production and guarantees than they were. These bright folks used Madoff to try to game the system - a system left vulnerable by a lack of regulatory oversight - but in the end they themselves were gamed by it. For year after year, they looked the other way. For year after year, they took the money and ran. They could have acted as a check and balance upon Madoff's age-old scheme (all reward and no risk) but they did not. They were as flawed and faulty and unhelpful and selfish as the bankers who ruined the banks and the corporate executives who gutted their own companies. In the end it's all essentially the same scam that brought us to this low place today. Some of Madoff's victims went on television Thursday to express their disgust with the Securities and Exchange Commission for failing to adequately regulate Madoff's investment house - and for blowing off the very loud whistleblower who tried to raise the alarm several years ago. They are right. There is no excuse for how badly federal regulators failed in their responsibility to identify and halt the sort of scam that Madoff ran for so many years. What's the point of having an SEC, or Congressional oversight functions, if such a massive fraud is allowed to last for so long causing so much damage? Even so, Madoff's crimes, and the government's regulatory negligence, do not negate the recklessness of the people who enabled Madoff year after year. They gave him their money and, worse, their client's money, and never asked aloud how one man with one plan could have legitimately done so much better for so long than anyone else on Wall Street. Please let's not hear these people claim anymore that they are now shocked - shocked! - that they didn't know that their crazy investment returns were not on the up-and-up. 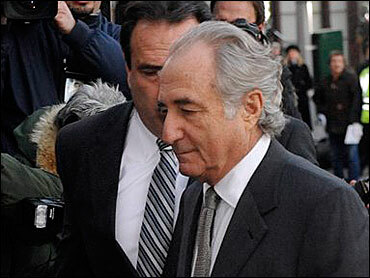 Those complaints ring as hollow today as Madoff's in-court apology. Sub-prime mortgages. Free credit cards. Madoff's scheme. There is a lot of cider pouring out of a lot of ears these days.